Wash Smart Laundry offers clean facilities, modern high-efficiency washers and dryers, helpful full-time attendants, competitive prices and many weekly specials to make your laundry day experience the best in Tyler, Texas. If you’re too busy to wash it yourself use our fast efficient Wash & Fold Service; just .99¢/lb., (12 lb. minimum.) Drop your laundry off and our caring attendants will wash, dry and fold your clothes and have them ready for pickup at your convenience. We’ll also wash your comforters, sleeping bags and other large items. Please call for pricing. Laundry dropped off before 9:30 a.m. is ready by 5:30 p.m. Drop off after 9:30 a.m. and your laundry will be ready for pick-up the next day. We accept Visa, Mastercard, Discover and most bank debit cards. 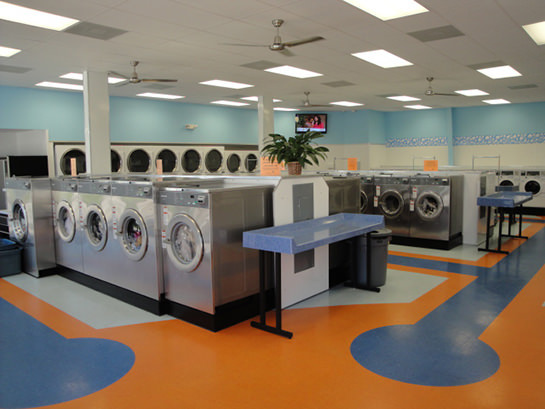 Enjoy our clean, spacious, air-conditioned store, free WiFi, large screen TV and affordable snacks while you wash. You’ll appreciate our clean, well-maintained washers. We offer the most high-capacity washers in town. What’s more; with our Laundry Card system you’ll earn valuable Reward Points with every visit. When you’re points redeem Free Bonus Dollars are added to your card account.